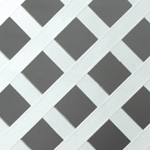 Veranda™ plastic lattice makes it easy. Durable and sturdy, it won’t rot, split or peel. It’s also available in a wide range of colors and styles. 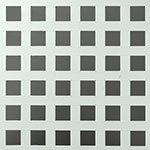 For a distinguished look, frame panels with caps and connect panels with dividers. 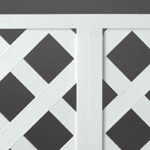 Easy-to-install cap and divider mouldings fit all lattice panels. 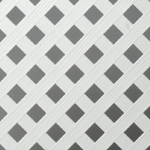 Caps and dividers are available in all eight colors for an exact match with the lattice. NOTE: The colors represented here are reproduced with printers’ inks and may vary from actual products. 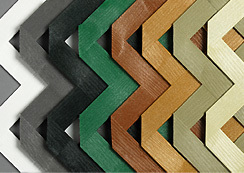 For actual product colors, please visit your Veranda dealer.